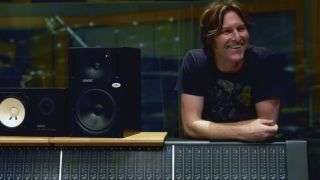 From film to TV, videogames to shock-rock, LA native Tyler Bates has done it all. You’ll have heard his score compositions in 300, Watchmen, John Wick, Californication, God Of War: Ascension and Killzone Shadow Fall, while his pioneering work on Guardians Of The Galaxy - where he wrote musical themes before cinematography even started - ended up influencing the acting and entire direction of the film. In between his high-profile scoring gigs, Bates can be found donning a modified Schecter Corsair with Marilyn Manson, co-writing and playing guitar on Manson’s triumphant return to form, The Pale Emperor, with the pair set to collaborate once more on this year’s forthcoming full-length, Heaven Upside Down. “As a guitarist, consider that when you play a simple chord progression an entire orchestral arrangement can be extrapolated from it. Chord voicings can be given to brass, strings and woodwinds, even tympani. The melody or arpeggiation you might play in a simple improvised chord progression can be given to strings, woodwinds or brass for solo melodies, so playing freely on the guitar is a good way to get ‘the idea’ in place. “When writing on guitar, think of dialogue, and pay close attention to the editing style of the visual media for which you are creating music. Would the guitar serve the picture best if individual articulations are not apparent, but instead are textural and ethereal, while perhaps a piano or cello clearly states the melody or chord progression? Or, is the guitar a driving force in the music that must be stated clearly and deliberately? “Consider working with sounds that are typically inappropriate for your ‘band’ recording or gig. Open your mind to all styles of music and appreciate the great ideas and musical techniques that are apparent in every style of music.